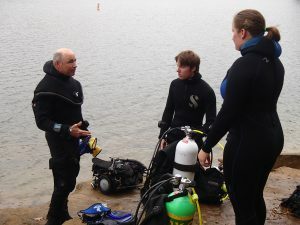 The Adventure Diver course is a subset of the Advanced Open Water Diver Course. Have you always wanted to try night diving, Nitrox, or dry suit diving? There’s a long list of scuba adventures you can take part in during this program. Complete three Adventure Dives and you earn the Adventure Diver certification. It’s a great opportunity to work with your instructor to build your scuba skills and gain more confidence. Get a taste of what you like and enjoy scuba diving more than ever. Beyond using basic scuba equipment, you’ll learn to use specialized gear depending on the Adventure Dives you choose. For example you will need a dry suit for the Dry Suit Adventure Dive or a camera for the Digital Photography Adventure Dive. We will explain the equipment that you need and may suggest additional gear, such as a dive light for night diving or a lift bag for search and recovery diving. Contact us to register for Advanced Open Water Diver Online – PADI’s eLearning option – to get started immediately. The web-based system lets you learn about seven of the most popular Adventure Dives at your own pace through an easy to use, interactive program. You also have access to an online version of the Adventures in Diving manual and can complete sections for other Adventure Dives as directed by your PADI Instructor. You can also choose to read the Adventures in Diving manual and watch the Adventures in Diving video (a book and DVD package). We can help you enroll in the course, get your materials and start learning. Contact KY Diver and we will schedule a time to meet with you to schedule knowledge review sessions along with your Adventure Dives.